Rha Bank in Uig, near Portree, Isle of Skye sleeps 6 people. Rha Bank near Portree has been furnished and equipped to a good standard to ensure as comfortable and relaxing a holiday as possible, with your every need taken care of. 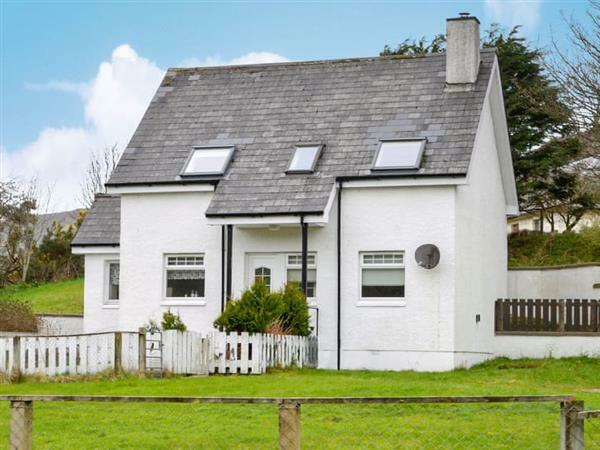 With good sized rooms and a beautiful view across towards Uig Bay, Rha Bank makes a great base for exploring this lovely part of northern Skye. Set in a sheltered horseshoe shaped bay on the west coast of the Trotternish Peninsula, Uig is a picturesque village with the usual small village amenities and is also one of the stepping stones to catch a ferry over to the Western Isles. Overlooking the Minch Uig, this property boasts a dramatic landscape and spectacular scenery. A visit to the magnificent Fairy Glen, a double waterfall is a must see, along with a trip to Clach Ard Uige – a relic of an ancient stone circle standing on the hills above the village, the Museum of Highland Life, the ruins of 17th-century castle Caisteal Uisdean and the Piping Memorial on the top of Glenhinnisdal, all well worth a visit. The area is renowned for its wide variety of walks for all levels of fitness ranging from a strenuous 22-mile walk over the Trotternish Ridge, the Quiraing and The Old Man of Storr to a gentle stroll down to the harbour to watch the fishing boats landing their catch. Take a visit to explore the islands ‘capital’ Portree with its range of shops, restaurants, pubs and art galleries and taking a wander down to its colourful harbour is a must. Further afield you can take a trip to Dunvegan Castle and gardens and from here take a walk to the coral beach, breathtaking on a lovely day. On the western edge of the island you can take a trip around the Talisker Distillery and visitor centre where you can sample their fine peaty single malt. To the southern ends of the island visit the Sleat peninsula known as the Garden of Skye where you can visit Armadale Castle and gardens. For the outdoor enthusiast, the Isle of Skye is a paradise. Climbing and hillwalking in the Cuillins, water-sports, sea trips and fishing around its unspoilt coastline along with pony trekking and birdwatching to name but a few of the activities on this beautiful island. The shop, pub and restaurant are all 200 yards from Rha Bank. Living room: With multi-fuel burner, 40 Freeview TV and DVD player. Kitchen/dining room: With electric oven, electric hob, microwave, fridge/freezer and dishwasher. Bedroom 3: With king-size bed. Electric central heating, electricity, bed linen, towels and Wi-Fi included. Initial fuel for multi-fuel burner included. Enclosed lawned garden with sitting-out area and garden furniture. Private parking for 2 cars. No smoking. Holidays at Rha Bank run from Saturday to Saturday. Pets allowed at Rha Bank. For a better idea of where Rha Bank is, you can see Rha Bank on the map below. Rha Bank is in Isle Of Skye; should you be on the lookout for a special offer, you can find all the special offers in Isle Of Skye. It's always worth checking to see what is on offer at the moment. Do you want to holiday near Rha Bank (UK11147), you can see other cottages within 25 miles of Rha Bank; have a look to find your perfect holiday location.